Categories: Tulika Books, Economics, Health. Tags: 9789382381648, FAO, malnutrition, nutrition strategy, sanitation, United Nations, water, WHO, world strategy against malnutrition. In November 2014, representatives from over 170 governments, together with leaders of inter-governmental organizations and civil society – including non-governmental organizations, researchers, the private sector, and consumer representatives –converged in Rome for the Second International Conference on Nutrition (ICN2). ICN2 was organized by the Food and Agriculture Organization of the United Nations (FAO) and the World Health Organization (WHO) to mobilize and unite the international community for the protracted struggle against malnutrition. The conference and its preparatory process provided a forum in which the world community, led by governments, affirmed its shared commitment to eradicating malnutrition by adopting the Rome Declaration and reaching agreement on a comprehensive, harmonized Framework for Action. Ending Malnutrition: from commitment to action aims to make available the insights and judgments that emerged from ICN2 to practitioners across the world. It begins with a review of current evidence on the prevalence and incidence of malnutrition across the globe. It then presents analyses of the most salient policy issues to be confronted in a concerted global effort to end malnutrition: strengthening food systems as the core of a sustainable nutrition strategy; promoting social protection to address underlying inequities as well as immediate needs that contribute to malnutrition; using fortification and supplementation, especially, to address micronutrient deficiencies; and ensuring improved access to water and sanitation for an effective nutrition strategy. 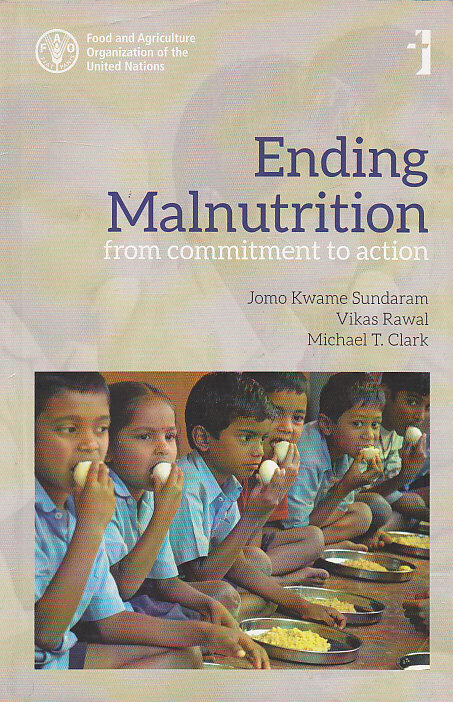 A concluding chapter focuses on the indispensable role that multilateral institutions can play in accelerating and sustaining global momentum on nutrition, and to secure a place for nutrition at the forefront of the post- 2015 sustainable development agenda. Throughout, the emphasis is on practical steps that can be taken by governments and their partners to end malnutrition in all its forms. Jomo Kwame Sundaram is Assistant Director General and Coordinator for Economic and Social Development at the Food and Agriculture Organization of the United Nations, Rome. Michael T. Clark is Senior Coordinator (Policy and Governance) at the Food and Agriculture Organization of the United Nations, Rome. Published in association with FAO.